Described by many as the ‘greatest literary show on Earth’, the ZEE Jaipur Literature Festival is on its way to its customary grand beginning on 24th of January 2019. The five-day event promises to bring together renowned writers, thinkers, humanitarians, politicians, business leaders, sportspeople, and entertainers from across the world to engage in meaningful debate and dialogue. The “Kumbh” of literature will be back with its brand of infectious energy on its twelfth year at its home in the historic Diggi Palace Hotel. The Festival, a dynamic coming together of ideas, and a literary, musical, artistic, culinary and historic extravaganza, has hosted nearly 2000 speakers and welcomed over a million booklovers in the past decade. For five days, it transforms the ambience of the Pink City infusing it with vibrancy and a plethora of events across key venues. During the Festival days, attendees have a frenetic schedule of being spoilt for choice between insightful sessions, and a surrounding and thronging carnival encapsulating a book store, food stalls, a teeming bazaar, artists at work, and multiple parties hosted on the Festival’s fringes. 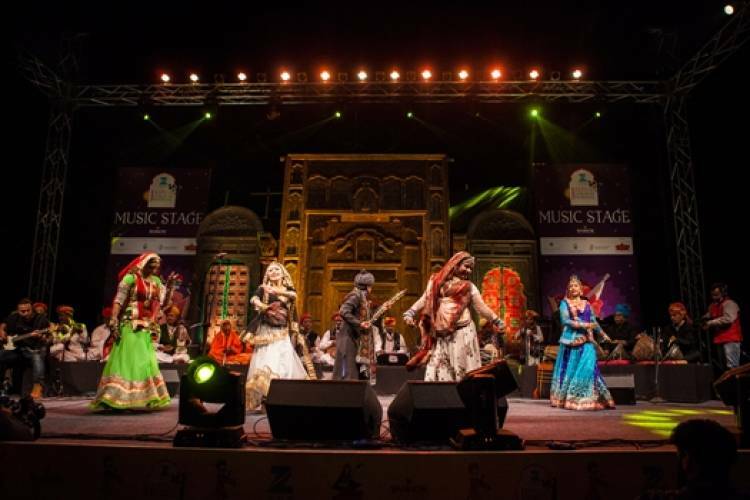 The Jaipur Music Stage, which runs in the evenings from Jan 24-Jan 27 parallel to the ZEE Jaipur Literature Festival, is your passport to go on an intense discovery of a world of music in the course of four exciting days. The Music Stage brings together hitherto undiscovered collaborations and unique sounds from Indian folk to international and indie music. Performing artistes include Indian Ocean, L. Subramaniam, DubFX, Jasbir Jassi, Kutle Khan, and the Nooran Sisters, amongst others.There will be performances from across the world; heart-to-heart conversations with artistes; exclusive after parties and a ‘night market’, as well as a live art installation. There’s also Morning Music at the Festival to look forward to, where melodious tunes offer the perfect start to a day of literary dialogue. Performing artistes include Barnali Chattopadhyay, Deepa Rasiya, Shruti Vishwanath, Usha Uthup and Vidya Shah. Every year, a part of the Festival is transformed into a heaving, pulsating bazar where artisans, craftsmen, and designers and entrepreneurs display and sell a vast array of hard-to-resist wares: embroidered shawls, exquisite minakari jewellery, funky stationery; edgy gifts; chic couture; spiffy footwear; exciting home décor. If you are literary groupie and will do anything to stalk your favourite author and queue up at dawn to buy his/her latest release as soon as it hits the stores, the Festival has special book-signing kiosks at all venues and you can get authors like Anita Nair, Anuradha Roy, Ben Okri, Colson Whitehead, Gulzar, Germaine Greer, Jeffery Archer, Shabana Azmi, Shashi Tharoor, Sohaila Abdulali and many more to sign copies on the sidelines of their sessions. You can also look forward to the launches of the latest works like Chitra Banerjee Divakaruni's The Forest of Enchantment, Kancha Ilaiah Shepherd's From a Shepherd Boy to an Intellectual, Navin Chawla's Every Vote Counts: The Story of Elections in India, Namita Gokhale and Pushpesh Pant's Raag Pahaadi. The five days of festivities at the Festival also offer a chance to indulge in a delectable culinary affair. A large number of food stalls spring up at the Festival Hub serving a variety of cuisines and beverages ranging from paranthas, sandwiches, and pizzas to even rajma-chawal and the Diggi family’s special palak-patta chaat andkhullad-chai. Whether you’re a fan of Marc Quinn, arguably one of the leading contemporary artistes today or have a soft spot for the various traditional art forms of India, or just want a stunning backdrop for that picture perfect moment, there’s plenty of art going around at the Festival. Marc Quinn will feature in a session After Bloodhead, exploring what it is to be human in the world today through subjects including the body, genetics, identity, environment and the media. There will be a live public art demonstration by Abhishek Singh who will capture the Festival on canvass over the five days, and another one by Jaipur based artist Sandip Gomay who uses live human models as his canvas and inanimate objects or subjects in a way that collapses depth and make his models appear two dimensional when photographed. The artwork is such that when spectators get their pictures clicked, it'll appear as if they have just entered a painting. Also on display will be tribal “Warli” art presented by the Ojas Art Award, featuring works of the 2019 edition’s Master Artist Rajesh Chaitya Vangad, and Protégé Artists Tushar Vayeda and Mayur Vayeda.